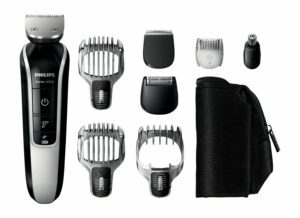 If you are looking for one of the most versatile and high-quality grooming kits in the market that can provide you great styling effects for your facial and body hair, you should consider the QG3362/23 series 5000 8 in 1 waterproof grooming kit from one of the world leaders in the industry, Philips. With this kit, you will be able to groom all the hair on your body and face, beard, mustache, and sideburns just the way you want. This will be your answer for all your grooming requirements and queries. Read through our reviews for all the features and pros and cons of this waterproof beard trimmer grooming kit here, so that you get to know more about the details of the product. Not fully waterproof as explained in the description. Some reviewers said they would not use it in the shower because it does not appear to have the water seals it would need to be waterproof. When it comes to all-round performance, the Philips QG3362/23 Series 5000 8 in 1 Waterproof Men’s Grooming Kit is a big hit, because it is loaded with additional settings and attachments that help you achieve the style that you want, without any hassles. It can literally trim any body hair you have from body hair, hair on your head, nose hair, beards, to wherever you grow it. This is a top rated grooming kit and we recommend it for your needs. It comes in at 3.9 out 5.0 stars with 71% over 4 stars, but over 10% over rated 1 star with very few 2 or 3 star ratings. It either hits the mark very well or not at all.